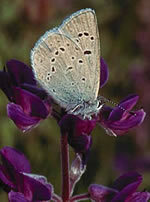 Two subspecies of the Boisduval's blue butterfly are listed as endangered. The Fenders blue butterfly (Aricia icarioides fenderi) was once believed to be extinct since the 1930s until discovered in the late 90s at Willow Creek and two other locations in the state of Oregon. Willow Creek is now one of only four places in the world where healthy populations of this butterfly are found. Since the late 90s the Willow Creek population has gotten larger and over 1000 butterflies were counted, up from only around 800 in 1993. Adult males are blue in the center, but the females have more of a dusky-white or gray color. The Fenders blue butterfly prefers to eat lupine and other plants that shoot up through the grass. 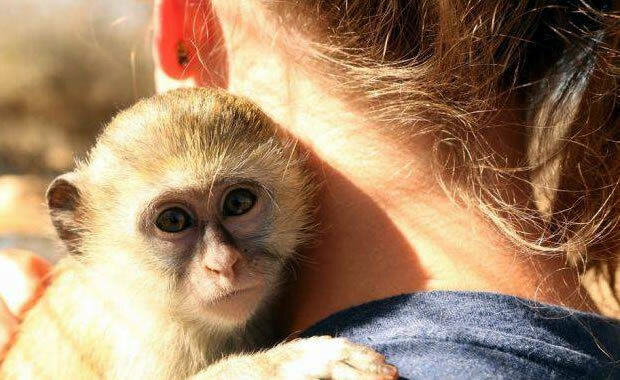 They are said to be very alert to potential predators, dropping from the leaves to the ground at any sign of danger. The butterfly larvae are said to attach themselves to the lupine, feeding on it until emerging as adults in the late spring. The adults get nectar from plants such as wild onion, pink checkermallow and flax. Adults only live about nine and a half days, laying eggs on the lupine. The larvae then go dormant from early summer until the following spring, remaining at the base of the plant in the winter. They each attach to the newly sprouted lupine in the spring. Habitat loss is the main cause of the Fenders blue butterflys decline. In an effort to save this butterfly, the US Fish and Wildlife service proposed protecting the species and its primary food source, Kincaids lupine under the Endangered Species Act. But conservationists believe that most populations of the Fenders blue butterfly may not survive over time because of the significant amount of habitat loss. The mission blue butterfly (Aricia icarioides missionensis) is only found in the San Francisco Bay area and are commonly found at elevations of around 700 feet. This butterfly has a wingspan ranging from 1 to 1.5 inches. Males usually have a white fringe and a dark black border with silver blue to violet blue upperwings. Females have dull brown upper wings and only small traces of blue. Both sexes' underwings are silver gray or brownish with black speckles. Preferred habitat for the mission blue butterfly is coastal scrubs and grasslands. Diet consists of various species of the lupine plant. Lupine is also used by the butterfly to lay its eggs. The butterflies depend on these plants for reproduction and can not survive without them. Adults appear between early March and early June when the flowers bloom and they depend on the plants for nectar. Females lay single eggs on the leaves, and the larvae hatch from the eggs after four to seven days. The larvae feed on the mesophyll of the host lupine for about three weeks. Caterpillars crawl down into the fallen leaves at the bottom of the lupine where they go dormant until the following spring. The mission blue butterfly has loss much of its habitat due to residential and industrial development, and lupine has become scarce causing the butterfly population to decline. This species was listed as endangered in 1976 and a recovery plan was drawn up by the US FWS in 1984 which included repairing some of its damaged habitat. Copyright Notice: This article is licensed under the GNU Free Documentation License. It uses material from the Wikipedia article "Aricia icarioides". Glenn, C. R. 2006. "Earth's Endangered Creatures - Boisduval's Blue Butterfly Facts" (Online). Accessed 4/21/2019 at http://earthsendangered.com/profile.asp?sp=562&ID=9. Need more Boisduval's Blue Butterfly facts?